The program Garbage Recycler is a program to clean your computer. This program will allow you to the entire set of your files to find those that are not needed, and delete them. Unlike other programs do not need to pre-specify which types of files you think unnecessary. The program itself will find all types of files, calculate their number and total volume. If you are actively working on the computer, you probably noticed that the programs create temporary files, which often remain to the completion of the work programs. Over time, they become very much, they take up disk space and ourselves becomes uncomfortable to search your files in a pile of garbage. To remove unnecessary files from your computer, there are many programs. One of them is Garbage Recycler. Ordinary users, but mainly programmers. They are a result of work on the project there is a set of temporary files. Deleting all files of certain types in the selected directories. Removing individual files of a certain type. If you do not know what information is stored in the files of this type, the program will open a browser page with a detailed description selected file type. The program is only concerned with the analysis of the file extensions, and deleting files. It does not clean up the registry, it does not deal with the acceleration of the boot, etc. The files will not be deleted. A window will appear asking you to enter a serial number. Enter the purchased serial number or click the button Try to work with the program in trial mode. 1. All copyrights on the "Garbage Recycler" is exclusively owned by the author - Alexander Alekseev. Name "Soft4other" is the pseudonym of the author of the program. 3. After payment, the user is granted a non-exclusive license to use the "Garbage Recycler" for any legal purpose; the user receives the activation code in an amount corresponding to the number of licenses purchased. An activation code is permitted to activate the "Wizard" on the same computer, but you can use the same activation code on the second and third computer, provided that the two programs at all (three) computers will use the personal user and / or members of his family and no one else. 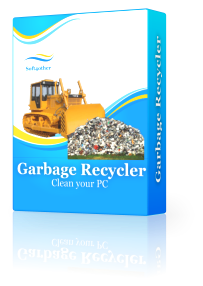 Customers pay for the license, receive technical support, gain new minor version of "Garbage Recycler" for free. 4. Installation files (zip-archive) "Garbage Recycler" can be freely distributed only in the form in which they are delivered, that means without any changes. You may not distribute "Garbage Recycler" on one carrier and / or in one software package together with piracy utilities for "breaking", Key files and generators of keys. 6. PROGRAM "Garbage Recycler" DISTRIBUTED "AS IS". THUS THERE IS NO WARRANTY, EXPRESS OR IMPLIED. YOU USE IT AT YOUR OWN RISK. THE AUTHOR WILL NOT BE LIABLE FOR DATA LOSS, DAMAGES, LOSS OF PROFITS OR ANY OTHER KIND OF LOSS WHILE USING (correct or incorrect) of the program. 7. Does not provide any additional fees other than the cost of the license associated with the creation and distribution of data files "Garbage Recycler." 8. You may not use, copy, emulate, clone, rent, lease, rent, sell, modify, decompile, disassemble, transfer licensed program or its part differently than described in the license. Any such unauthorized use shall result in immediate and automatic termination of this license and may result in criminal and / or civil prosecution. Do not use the binary code "Garbage Recycler" to reconstruct the algorithm of the program, which is the property of the author. 9. Installing and using the "Garbage Recycler" indicates your agreement with the terms of this license. 10. If you do not agree with the terms of this license you must remove files "Garbage Recycler" from your storage devices and cease to use, "Garbage Recycler." Thank you for using the program "Garbage Recycler"! Fixed error displaying large file sizes. The program allows you to select directories and analyze how much space the files occupy a certain type. You can delete all files of the selected types. Or you can from all the files of a certain type to select only those that you wish and delete them. What should I do if I accidentally delete the wrong files? How to cancel the selection of records? Double-click the mouse on them and they will return to their original location. Can program delete files from a network drive? Of course! But in this case there will be certain limitations. For example, you can not handle the large number of objects at a time. During the removal of the files I received reports that some of them can not be removed. Why can not they be removed? What should I do? If the files are currently open in another program, then delete them did not succeed. You can complete the work with these files or close the appropriate application and press button Retry or simply ignore the file by clicking button Ignore. I found one bag! If size amount of files is big than cell information have negative value! Oh! I overlooked this mistake!Thank you! Some interface differences. Maybe someone will like this product? Nice program. But very brutal box.